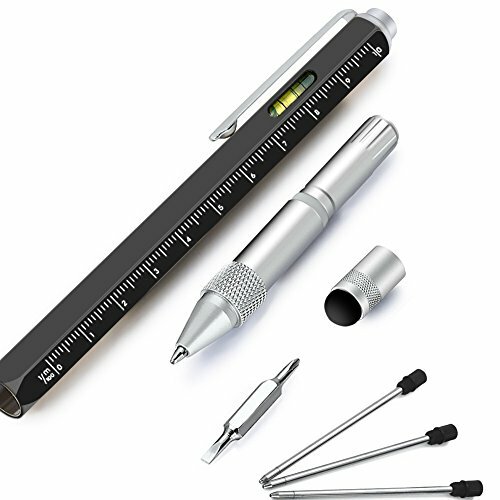 Useful Gadgets for Men: Multi Tool Pens Combining 6 Handy Functions:a Scale Ruler , a Spirit Level, a Ballpoint Pen(4 The Pen Refills) , a Touch Screen Stylus Pen , a Small Screwdriver Set(Flat-Head And Phillips). After-Sales Service: Fruitman is Committed to Providing Each Customer Wholehearted Service and Assume Responsibility for Quality of Each Products. Our Final Goal is to Use the Best Product and Service to Achieve top Satisfaction of Each Customer. If You have Any Question or Suggestion, Please Get in Touch with us. We\'ll Make Reply as soon as Possible. Great Pen with nice amount of refills!